Interests: Make good stuff in halo custom edition. darksoldier has contributed to 846 posts out of 468638 total posts (.18%) in 3,039 days (.28 posts per day). I'll try to translate it for you guys. Your project is very interesting in some points. However, make a new story based on "before reach" isn't a good idea for me. Why ? Because, to do simple, halo reach game is sloppy (except graphics), it doesn't represent the war that raged on the planet reach as described in the books, the end is mediocre and not finalised. So now you want to make a scenario "before reach"? It would be completely absurd, it is necessary to know that apart from some skirmishes here and there with the covenants, the "conflicts" before reach invasion "were not frequent, almost nonexistent. So to summarize, use the term "before reach" is not necessarily a good choice, maybe you could launch yourself in another scenario choice, maybe in a conflict at the same time as the invasion of reach, or why not during the retreat military forces present on the planet. Doing something before the halo event reach is useless I think. Thanks for all the feedbacks. So, after reading your feedbacks, i've tried to improve some details here and there, what did you think about it now ? For the hologramme's structure, I want to stay in something simple, to stay in armony with the rest of the bsp. Cependant, reprendre une "campagne" sur "l'avant reach" est pour moi inutile. Pourquoi ? Alors tout simplement, le jeu halo reach �tant un flaupe total (hormis graphiquement parlant), ne repr�sente absolument pas la guerre qui a fait rage sur la plan�te reach telle qu'elle est d�crite dans les livres, la fin est m�diocre et pas peaufin�e. Alors maintenant se lancer dans l'avant reach ? �� serait compl�tement absurde, il faut savoir qu'a part quelques escarmouches ici et la avec les covenants, les "conflits" "avant reach" n'�taient pas fr�quents, on peu m�me dire presque inexistants. Donc pour r�sumer, utiliser le terme "avant reach" n'est pas forc�ment un bon choix, peut �tre pourrais tu te lancer dans un autre choix de sc�nario, peut �tre un conflit en m�me temps que la guerre de reach, ou pourquoi pas pendant la fuite des derni�res forces militaires pr�sentes sur zone :) Franchement, faire quelques chose avant les �v�nement d'halo reach est inutile je pense. Very nice work guys ! I watched the video of your works, and it is very awesome ! Can't wait to see more about it ! Very interesting project ! Great job guys ! I tried to reproduce the interior of the Pillar Of Autumn for a new project while adding personal touch. Does it look like? 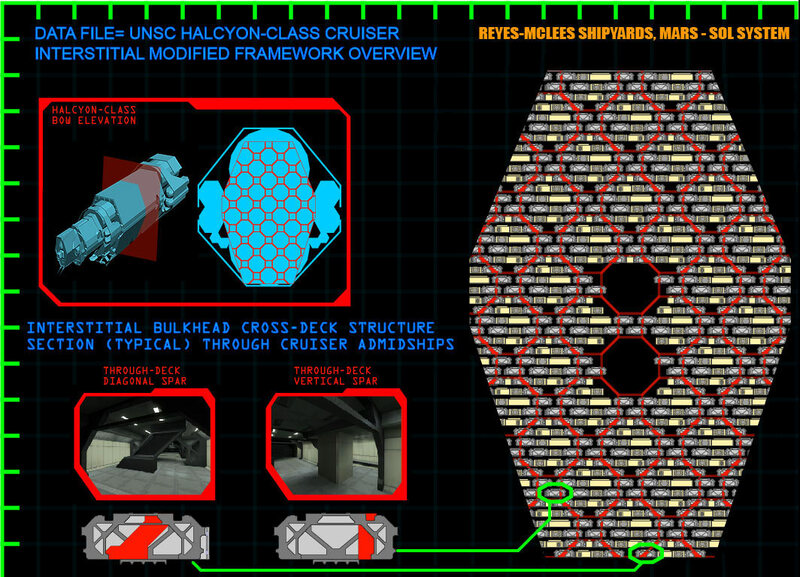 An important thing to consider when attempting to recreate the Autumn's interior is that Halcyon-class cruisers are noteworthy for their honeycomb lattice of internal cross braces, so you probably don't want want long sections of uninterrupted corridor. It's also a warship, so massive windows are also a no-go. Thank you for the reply, I'll try to do my best to get closer to the original style of the Pillar. I have another question, do you have anything that can help me in creating a armory ? I tried to reproduce the interior of the Pillar Of Autumn for a new project while adding personal touch. Does it look like ? I have fixed the texture for you ! Not the best texture in the world but the result is good ! I did a little tutorial, to help you to improve your cliffs. First of all, they are many methods to get good looking cliffs, I will give you a simple one. Not bad. My approach is similar - I start with a flat plane, tessellate once or twice (less than you) and then in Editable Poly I use the Slice tool to cut in other directions besides vertical/horizontal. Then, in order to make more organic extrusions, I use Soft Selection to move vertices. If it's too high-poly, I use the optimize modifier, but only in some sections (in order to retain a natural look). Most importantly, I Unwrap UV last, because I don't like being preoccupied by UV's when editing geometry. As far as UV unwrapping goes, apply quick planar maps in sections, then open the Unwrap Editor and weld to get rid of the seams. 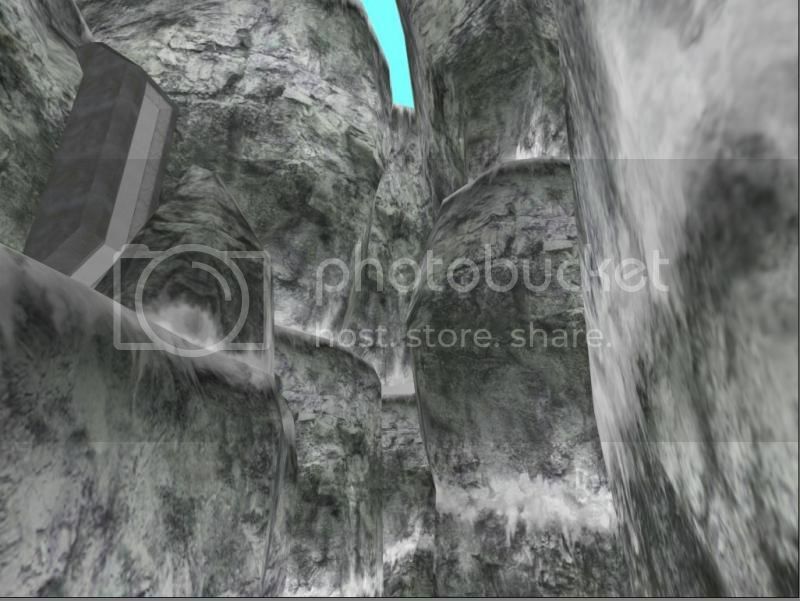 Also make sure the bottom/top of the cliff lines up with the bottom/top of the texture (like darksoldier pics). Then Relax the parts around your extrusions (careful not to use Relax too much). Smoothing groups come last (because it's easier to spot ugly extrusions without them) but at that point I usually just use Auto-Smooth. I edited the orginal texture, to make it more darker with less light. See under the new texture. Not the best I can do, but if you want to keep this texture, it will maybe help you a bit. About the shader, try using the same shader as in b30 (cliffs.shader_environment). Just replace the old textures by your own. I tested the texture myself, and it's much better now, but it's need alot of work. I used the shader "Cliffs.shader_environment" and I replaced the old textures by the new one. However, we can see the texture is not reliable, so I recommend you to change it by a better texture (who is reliable). First, that's how you cliffs are looking in 3ds Max. After you've done, you'll get something like that, better and clean. Now apply a clean texture in your model. When it's finished, right clic, and select again (convert to editable mesh), select vertex, and go to "soft selection" and select "Use soft selection", enter the number do you want in "fallof". And now play with it. When you've done, select polygon and now select your cliffs with it. Now go to "smoothing groups" and select "auto smooth". And now, you have nice looking cliffs !